One of modelling's most enigmatic faces makes another stunning comeback with a solo cover appearance and featuring editorial for Love Magazine. Shot by Mert Alas & Marcus Piggott, grand dame Linda Evangelista illustrates why after more than twenty five years in the modelling game she is still one of the industry's most sought after models. 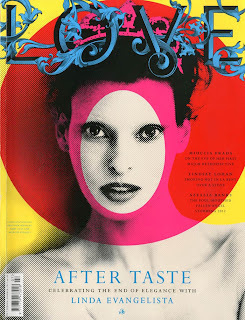 Evangelista appears on the visually arresting fluorescent cover image channeling punk artist Jamie Reid. In the accompanying interview with Love, Evangelista candidly discusses her once famous quote, "I never get out of bed for less than $10,000 a day" by countering that "I was astonished by it. I still am, absolutely. It is the fee that is given for my services, my image, and not me as a person. It's Linda Evangelista."